What a memorable day exploring Ggaba market close to Munyonyo by Lake Victoria, Uganda! 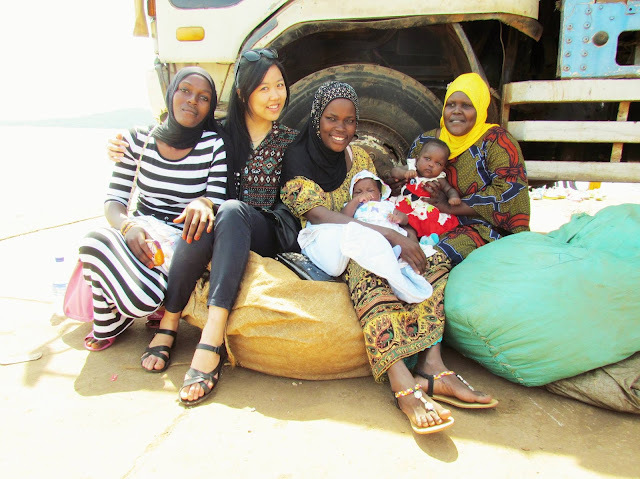 For some reason, I decided to walk to the pier and turn a corner round a huge truck - and that's where I met these beautiful ladies named Halima and Lukia who invited me to sit with them and their babies Shawal and Hanisha. They were from Arua, Northern Uganda. As we chatted, Halima asked me if I was Muslim too, and I said I’m a follower of Isa (Jesus). Before parting ways, I asked if I could pray with them and bless their lovely daughters. They agreed smilingly with open hearts. We sat on those market sacks and did just that, finishing in unison with an "Ameen". It just strikes me that sometimes you walk through places and you never know who Jesus might want you to meet and open your heart to. It’s really a daily adventure of listening and walking by faith, and not limiting your horizons to what you already know!